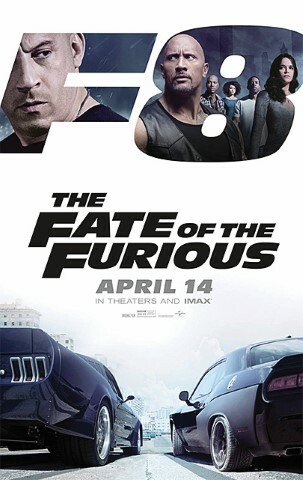 “The Fate of the Furious” is the eighth film in the Fast and Furious franchise. That’s right, those early 2000s street racing movies have transformed into one of the premiere blockbuster series on the planet; and there are already at least two more of them on the way. The last few installments have been just as over the top, as any comic book film out there, with a plethora of absurd action sequences that completely defy physics. That being said, I am going to categorize, “The Fate of the Furious” as a superhero action comedy of sorts, since this latest chapter is even more extreme than its predecessors. Once again, this movie features an absolutely star studded returning cast, with the exceptions of the late Paul Walker, Jordana Brewster and a few others. Vin Diesel, Dwayne Johnson, Jason Statham, Michelle Rodriguez, Tyrese Gibson, Ludacris and Kurt Russell all reprise their previous roles, while names like Charlize Theron, Scott Eastwood, and Helen Mirren join the party. For whatever it is worth, the “plot” of this movie is rather straightforward, but there are a handful of twists and surprises blended throughout. Having said that, I will keep my summary brief and spoiler-free. As seen in the trailers, this time around Dominic Toretto (Vin Diesel) is sucked into the world of terrorism and pitted against his former team/family. “The Fate of the Furious” simply has to be the most ridiculous movie that I have ever seen, but that is not necessarily a bad thing. This franchise seems far more comfortable in its own skin, being more self-aware than ever before. For the most part, the mood is pretty light throughout and there are countless one-liners to laugh out loud at; particularly the humorous banter between Dwayne “The Rock” Johnson and Jason Statham’s characters. Every single action sequence is more preposterous than the last, but I truly admire the creativity it took to put it all together this time around. Right from the opening scene, any sort of reality is thrown out the window and from that point on, this movie is just stupidly entertaining. Personally, “Fast Five” is the only film in the series that I find worth re-watching at this point and remains my favorite installment. However, “The Fate of the Furious” is even more exciting than the last two chapters and well worth checking out in theaters.